Fashion Media PH: Got your Levi's All Acess Card? The strobe lights are dancing and the hottest parties in town await you! Whether you are grooving in Manila, chilling in Bacolod, rocking in Cebu or shuffling in Davao, Levi’s®	brings you a chance to party all year long! Dress up, put your highs heels on and hop into the blinding lights. Go to the hottest parties all over the metro as Levi’s® gets you free year-round access for two(2) at Republiq (Resorts World Manila), Fever Luxe Lounge (Sofitel Manila), The Manor (Eastwood City), Luxx at Vudu (Cebu) and Starr (Davao). Plus, you can get 10% discount for cash purchase on food and beverages at Opus (Resorts World Manila), Epic (Boracay), Mushu (Bacolod), Hybrid (Davao), Abaca (Cebu), A Café (Cebu), Maya Restaurant (Cebu) and Formo (Cebu). Hyping the pop culture are the newest who’s who of party and style! Letting loose on the dance floor are the new Levi’s® All Access Card Ambassadors. Radio DJ, Jessica Mendoza gets the trending beats as she plays the latest party sounds in her afternoon radio show. TV Host and Radio DJ, Andi9 is considered as the “Cutest DJ” in the industry! Her bubbly and sweet personality resonates in her shows. Stylist to the stars, Alyanna Martinez, is one of the most beautiful faces of 2011! Her creative prowess makes her one the best stylists in Manila. Philippine AZKAL Midfielder, Misagh Bahadoran, knows how to kick-off the party with his charming personality. Being part of the Philippine National Football Team, Misagh brings great honor and pride to the Filipinos. Club DJ and Model, Alex Pain, juggles his time playing party-pumping house music and posing for top fashion glossies in the country. Be on the night shift and be part of the best party crowd! 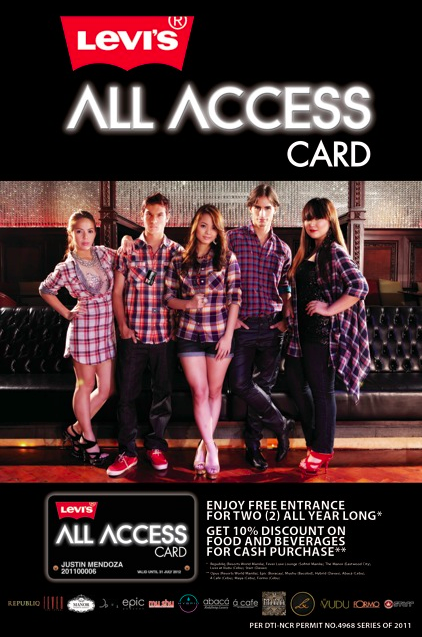 Enjoy all these exclusive privileges only with Levi’s® All Access Card. Paint the town red only with Levi’s®.